Good web design is not just about looking good and utilising the right colours; there are a certain level of practical features that need to be considered. Most importantly, websites need to be reassuring to their users. This might sound strange – but it is something that can often be over looked. As an example, here are some of the key areas in web design – from the SSL Checker to having a clear purpose; these are all things every website needs to consider. If you want to keep your customers happy and satisfied, make sure to include these in your website’s design and infrastructure. All websites serve a purpose and this should be clear straight away. A blog, for instance, should jump straight into the latest blog post. An online store, on the other hand, needs to represent the fact that it is a store. This is why most online stores have offers and promotions on their front page. It instantly grabs your attention and reflects the fact that it is a store – you are here to buy things – and that is its purpose. A lot of this can be done with simple navigation – if a user has to search through the home page to find the main point of your company, it doesn’t work – but some digital technology can also be used. If you’re a shop, for instance, put extra effort into the online basket and payment services. A blog, on the other hand, needs to have an easy way of searching content – following the author and other social interactions. These are the website’s purposes, straying away from these only confuses the user and will increase bounce rate. Similarly, people want to feel safe when they’re online. This is especially true for e-commerce, but every website should want to reassure users that they take online protection seriously. Most web browsers have a built in SSL checker, often provided by Thawte , which checks the level of Secure Sockets Layer encryption. This is shown as a grey padlock, or green padlock with SSL Extended Validation, as well as a URL with HTTPS, rather than HTTP. While more advanced and technical SSL Checker tools are available, users will look for these signs. If you don’t have the SSL certificate you are running the risk of losing your customers to a safer and more secure website. 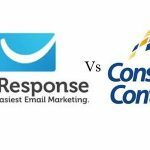 GetResponse Vs Constant Contact: Which one should you go for? I consent to TechPaparazzi collecting my details through this form.